The shape and texture are similar to chocolate brownies, but the ingredients are different. Blondies substitute vanilla for brownies’ cocoa powder. They contain brown sugar instead of white sugar (photo #1). There is no chocolate or cocoa in the batter, but chocolate chips can be mixed in. In addition chocolate chips (any type-photo #2), popular mix-ins include coconut, pecans or walnuts, toffee chips, even M&Ms. Some people add a second sweetener: honey, for example, or maple syrup blondies. Blondies tend not to be frosted, since the brown sugar is sweet enough. However, chocolate ganache is a nice (if messier) alternative to chocolate chips (photo #3). 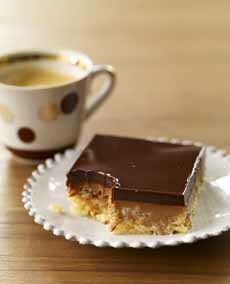 Since the beginning of recent food trends, some bakers use salted caramel ganache or dulce de leche. Blondies differ from white chocolate brownies, since the latter have white chocolate in the batter. We’ve encountered some blondies with chocolate chips called Congo Bars, but accurately, Congo Bars have both chocolate chips and walnuts; coconut can be substituted the walnuts. 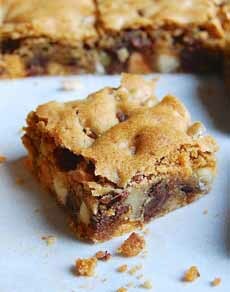 Like brownies, blondies are bar cookies cut into rectangles or squares. They’re great as a base for a sundae, topped with butterscotch, caramel or chocolate sauce. We know the history of brownies, but where did blondies originate? Like brownies, blondies originated in the U.S. We’re just not absolutely certain of their creator. The first person publish a recipe for the brownies we know today was Fanny Farmer, in the 1896 edition of The Boston Cooking-School Cookbook (the history of brownies). But that recipe contained no chocolate; it was essentially what we today call a Blondie. According to Food Timeline, blonde brownies predate the chocolate version by about 10 years. Around 1896, a molasses-flavored bar cookie (no chocolate, cocoa or chocolate chips) called a brownie appeared. The name honored the elfin characters called Brownies, featured in popular books, stories, cartoons and verses of the time by Palmer Cox (the Eastman Kodak Brownie camera was also named after these elves). According to another source, in the 1906 edition of her cookbook, Farmer published an updated version of her cookbook that included a blondie recipe and a brownie recipe, both called brownies. Alas, we’ve only been able to get our hands on the 1896 version, reprinted and available on Amazon (link above), so we can’t do our own fact-checking. After the later introduction and popularity of chocolate brownies, the molasses brownies became known as blonde brownies. Subsequently, some bakers started to substitute brown sugar for the molasses, providing a butterscotch taste and a new name, butterscotch brownies. 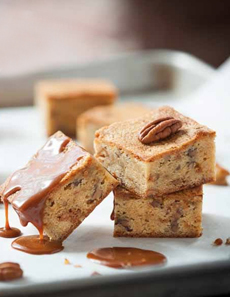 Blondies with pecans, served with dulce de leche. Blondies can have a finer crumb (texture) if cake flour is used instead of all-purpose flour (photo courtesy Valrhona). A classic, rustic blondie with chocolate chips and walnuts (photo courtesy King Arthur Flour). Blondies iced with chocolate ganache, at Baked NYC. Also according to Food Timeline, the name “Blondie” surfaces in the 1980s. It was not named for Dagwood Bumstead’s wife. Although we grew up in the food wonderland that is New York City, we don’t recall seeing a blondie or a butterscotch brownie until the mid 1970s or early 1980s. Then, some time around then, an artisan bakery whose name, alas, we can’t remember (and is no longer in business) began selling packaged blondies, brownies, chocolate chip cookies and other baked beauties in small grocery stores and delis. The line was superior to anything else being sold—and they introduced the New York we knew to blondies. If you’re that bakery and are reading this, tell us your name…and thanks for the memories!